The US Army needs amphibious vehicles. The M2 Bradley and M113 APCs are technically capable of slowly crossing calm bodies of water using their spinning tracks for slow propulsion. However, the seals on these "watertight" vehicles leak since rubber dries over time, so they never even try to swim. Truly amphibious vehicles called "amtracks" have a protruding "snout" to keep water from flowing over the top and into open hatches, rudders for steering, and water jets for propulsion or gears to allow the main engine to drive propellers, like the US Marine Corps' LAV-1. 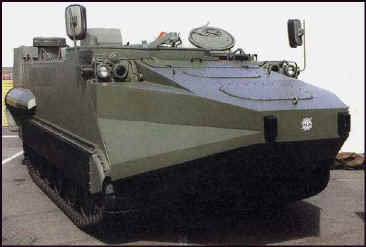 Marine wheeled Light Armored Vehicles (LAV) surprised Panamanians during the 1990 invasion by swimming the Panama Canal. Modifications to allow medium weight-armored vehicles to cross water obstacles are not complex or expensive; tanks are too dense to float. Modified APC "amphibians" may not be "oceangoing" like the US Marine Corps' amtrack (below) that can operate in heavy seas because they are designed to turn upright should a wave flip them over. However, APC amphibians can cross rivers, lakes, canals, and marshes. They can also land in calm seas from transports in areas without piers or when shallow waters do not allow large transports to dock. When the US Army announced its desire to acquire LAVs in 1999, experts assumed the Army was finally addressing its need for amphibians. They were later appalled to learn the LAV III "Stryker" cannot swim since propellers and rudders were deleted to save weight. The US Army conducted more large amphibious operations than the Marine Corps during World War II, but has forgotten that after 70 years. The Army's mighty armored forces cannot cross water and can be easily thwarted by destroying bridges, or focusing defenses around them. Most bridges around the world cannot support an M1 heavy tank anyway, and some cannot support the Bradley. Armored vehicles are also easily blocked in mountainous areas, except for amphibians that cruise up rivers or along the coast to bypass obstacles. Moreover, the Army has nothing to attack across rivers, except to put infantrymen in rubber boats and tell them to paddle across like the 101st Airborne did in World War II. The US Army actually practiced this technique prior to the 2003 invasion of Iraq. The Army also needs amphibians for "impassible" swampland. When the French fought in Vietnam in the 1950s they made extensive use of amtracks. Twenty years later, US Marines were assigned the drier northern sector, and the Army found itself unequipped for fighting in the marshy Delta region. The Army must relearn "amphibious envelopment" tactics of sending amphibians out to sea or into a lake or large river to outflank an enemy, something they used in the Pacific during World War II. During training operations in northern Norway, "attacking" US Marines were easily blocked in mountainous roadways. However, the Marines learned to outflank the "enemy" by sending amtracks across fjords. The US Army needs amphibious vehicles that can off-load from cargo ships and swim ashore to surprise an enemy, or in areas where no piers exist to offload. The US Marine Corps tried to develop a high-tech amtrack called the EFV, but this was cancelled due to soaring costs and technical problems. It is impossible to build an amtrack that is both fast and heavily armored. A better option is a small LCUs like the new Spanish LCM-1E that carries a single armored vehicle. If the vehicle needn't be "fully amphibious", i.e. not required to float in heavy seas and right itself should it roll over, an Army can upgrade and modify some of the thousands of proven M113s into amphibians. The Italians built a modified M113 amphibian. (pictured) An even better idea is to procure a modern APC based on the Bofors CV90 and modify that for amphibious operations. Armies also need some amphibious trucks like LARCs that were valuable in past wars. Amphibious scout trucks like the British Gibbs Humdinga (pictured) should prove valuable. This sporty vehicle can travel like a light truck, but can also make 30 mph at sea. Their sports car version zoomed across the English Channel. These are much more expensive than light trucks, yet far less expensive than armored vehicles. While their amphibious capability may be rarely used, it will provide a critical capability at times.